Check out our events page for upcoming specials, art openings, music and information on what we do. Taking the time to care about food and coffee doesn’t come cheap, but we make every effort to offer this food affordably, and we do our best to keep a selection of items on our menu that are within reach of all pocketbooks. San Francisco’s Veritable Vegetable provides most of our produce, which they purchase from farms including Jayleaf, Willey Farms, Fratelli Farms, and Las Palmalitas Ranch, all in California. Our deli meats come from San Francisco’s Molinari Brothers and Zoe’s Meats in Santa Rosa. Our dairy products come from Gilt Edge Creamery, also in San Francisco. Our soups, scones, muffins, and pies are made from scratch here in our kitchen. Because so much of our produce is seasonal, we change the menu depending on what’s available. While coffee cannot be produced locally, we can still be responsible in how we purchase it. 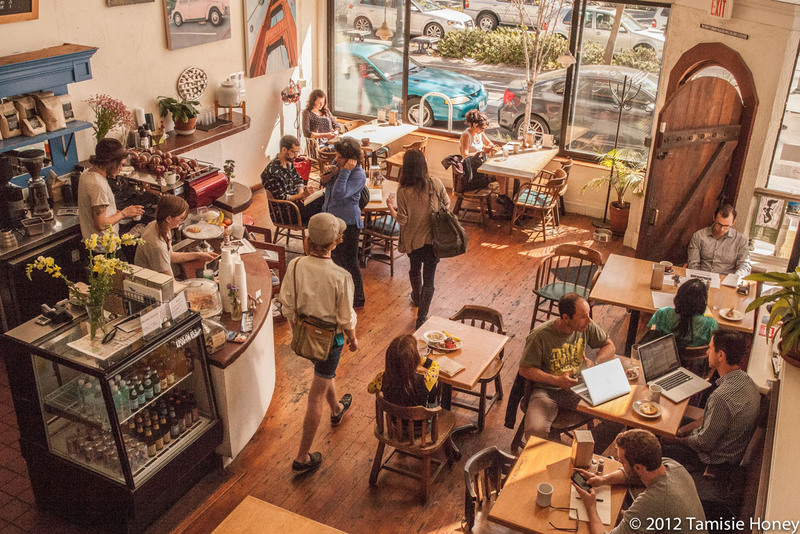 We buy only organic, fair-traded coffees from micro roaster De La Paz, located on Mission Street in San Francisco. To keep true to the flavor of these exceptional coffees, we individually prepare each cup, whether it’s drip or espresso. Of course if you’re in a hurry, we serve French Press coffee every day, especially in the morning.